As the warm summer months slipped into the crispness of fall, I felt the start line of the Kona Triathlon drawing near. I had prepared as best as I could. I felt healthy, and I was in the best physical shape of my life. But would it be enough to conquer the lava fields that had defeated so many before me? Remember, we’re talking about navigating through a 2.4-mile ocean swim, biking 112 miles through the crosswind filled-lava fields, and topping it off with a 26.2 mile run. The week of the race was stressful, to say the least. Not only did I have to prepare mentally for the race, but I also had to do all of the NBC interviews, including making time for them to come and film me with my son, Nash. Because this wasn’t just a race. It wasn’t even “just” an elite triathlon, the race that the best athletes in the world dream of completing. I had been offered a place at Kona for one reason, and that was to raise the money and awareness necessary to get special-needs children out of institutional care and into real families. I wanted to have a great race, but even more I wanted to be able to communicate well on behalf of those children. My work could mean the difference between life and death for some of them. The day of the race dawned. I found myself treading water surrounded by nearly 2,000 other triathletes. The cannon erupted, signaling the start of the 2012 Ironman World Championship. Instantly I was buffeted by the thrashing of legs and arms as we all fought for position, racing towards the endless blue of the Pacific. The swim was long and it was tough. By the time my toes touched sand again, I was winded but felt strong. The next steps were all instinctual. Helmet, glasses, shoes, go. I ran my bike out to the mounting area, jumped on, clipped in, and set off. 112 miles of blacktop now lay in front of me. After a few miles, I could finally begin to take it all in, to embrace my surroundings and appreciate this special experience. It was hard not being emotional thinking how blessed I was to be racing on behalf of these children. The first 80 miles of the bike ride were fun. I was clipping along at a good pace, and the wind was manageable. The last 32 miles were anything but. My body was really beginning to hurt. I was taking in as much fluid as possible, but still felt drained by the five-and-a-half-hour ride. The bike/run transition area was a welcome sight, especially with my family there waiting for me. “I got this,” I said to myself. I jumped off the bike, slipped on my shoes, and attempted to start running. It was like I had hit a wall. Every step was painful, and I was very tight from the bike. How was I going to run 26.2 miles? How was I going to finish the race? The doubts crept in. My body told me to just stop and walk, but I knew I might never finish if I gave in to that temptation. And I knew I’d be a more effective advocate for those kids if I did finish. So, I kept pushing forward, one step at a time, one mile at a time. It never got easy, but my mind began to manage the pain. The finish line became an obsession. I began seeing athletes lose their legs and their will. They lay on the side of the road with emotion on their faces, knowing their dreams of finishing Kona were over. The rest of us soldiered on, hoping that our training was enough to carry us through to the finish. It was around mile 24 that I knew that I was going to finish. I wept tears of gratitude as I ran. I made the final turn on the course, and there in the distance I could see the tower representing the end of my journey. Adrenaline flowed through my veins and my pace quickened. Crowds lined both sides of the final 100 yards. 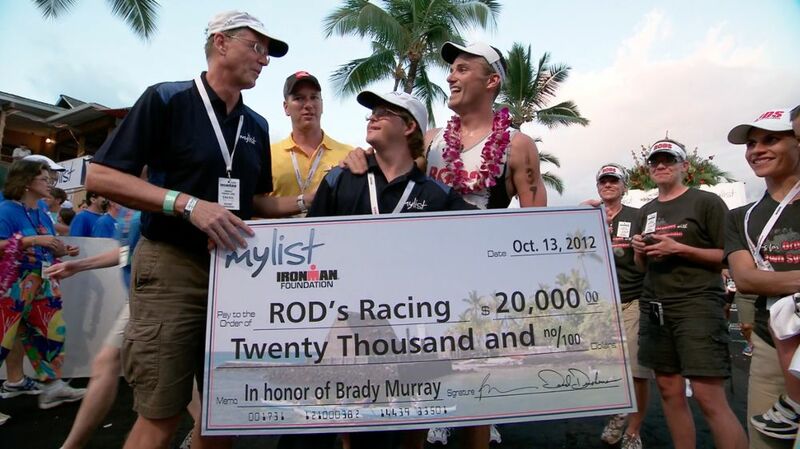 As I crossed the finish line, I heard the words I came to Kona in hopes of hearing; “Brady Murray, you are an Ironman!” My family was there, and I hugged Andrea like I had never hugged her before. Then I got a big surprise. A giant check made for $20,000—the exact amount needed for the adoption grant of the little girl I was racing for. The countless hours of training, all of the suffering on the course, the sacrifices by my wife and children, all of it was worth it because now a child would be getting a home. Fast forward to today. RODS (Racing for Orphans with Down Syndrome) continues to thrive and grow as hundreds of athletes each year dedicate their racing efforts for the cause of bringing home orphaned children who have Down syndrome. Last month we reached a milestone of $1,000,000 raised since 2012. Most important, through the efforts of so many, 35 orphaned children now have a loving family to call their own. We have witnessed first-hand that when we allow ourselves to get caught up in a cause bigger than ourselves, we will witness miracles. The best part is I have a feeling that we haven’t seen anything yet. Only a couple of chapters of this book have been written so far, and there’s so much good yet to come. I know if we strive to keep our hearts pure and our minds towards the cause, then even greater miracles will come. I can’t wait to see what the next chapter holds. RODS is not a subsidiary or affiliate of MML Investors Services, LLC or its affiliated companies.